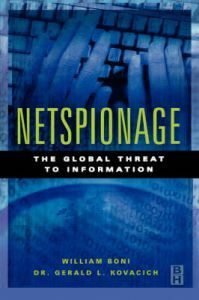 This book begins by laying out a history of espionage that clearly shows that when a new technology or technique becomes available to the information gatherers in public and private sectors, they can quickly be adopted for Netspionage use. It then moves on to describe how the Internet and associated technologies have already revolutionized the collection and analysis of competitive information. The convergence of dependency on networked and exploitation tools (often propagated by 'hackers', 'cyberpunks', and even intelligence agencies) has already resulted in several incidents that foreshadow the perilous future. Close study of these incidents demonstrates how difficult yet how important it is to confront the challenges of 'netspionage' and its less intrusive cousins. The authors present a set of the known incidents and then outline protective measures that will reduce the potential and consequences of netspionage. Unlike most security books, this one is written for managers and executives in non-protection roles of the organization, since they are the ones who must take a leadership role in safeguarding the information assets of the networked enterprise. This is a practical guide written from front-line experience. It explains the evolution of information collection and why it has never been easier. It highlights the tools of the trade and how they can be put to best use. Dr. Kovacich has over 40 years of security, criminal and civil investigations, anti-fraud, information warfare, and information systems security experience in both government as a special agent and as a manager in international corporations. Dr. Kovacich currently resides on an island in Washington state where he continues to write, lecture and conduct research relative to information systems security, information warfare defensive and offensive operations, high-technology crime and techno-terrorism.